Moran’s subtle 9/11 tribute leaves the listener as a requiem should, with half the heart sheltered in melancholy and the other in hope. The initial chord of Trinity Requiem’s “Introit” is full of Herculean power. Demanding the attention of the listener, it plummets into a cello choir deep in wide, dramatic vibrato before introducing the stars of the album, the Trinity Youth Chorus. With only three adult voices among its ranks, the Youth Choir displays needed restraint and appropriate solemnity throughout, as well as some deft diction and phoneme handling. Composer Robert Moran intentionally avoided genre categorization through the past half-century, having studied with Berio and Milhaud and palled around with Cage and Feldman. Here his writing is entirely tonal, allowing occasional dissonances to take on expressive weight. 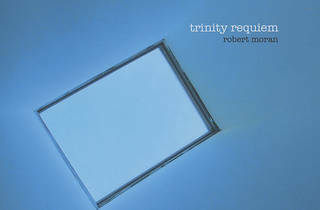 Trinity Requiem is a tribute, composed for the tenth anniversary of September 11. The fact that this would not necessarily be evident to an uninformed listener is one of the piece’s greatest strengths. An unintentionally recorded police siren at the opening of the cello-led “Offertory,” which was eventually left in by Moran and producers, stands as the only direct September 11 reference. This less obvious approach allows you to have your own experience in reliving the images, sounds and personal aftermath of that horrible day, rather than guiding you through it. “In Paradisium,” which concludes the piece, with its glorious descending vocal lines, seraphic harp accompaniment and rapturous cello, leaves the listener as a requiem should, with half the heart sheltered in melancholy and the other emancipated in hope.